Immigration is falling. Be careful what you wish for..
Today’s immigration figures are the first with any meaningful data after the Brexit vote. 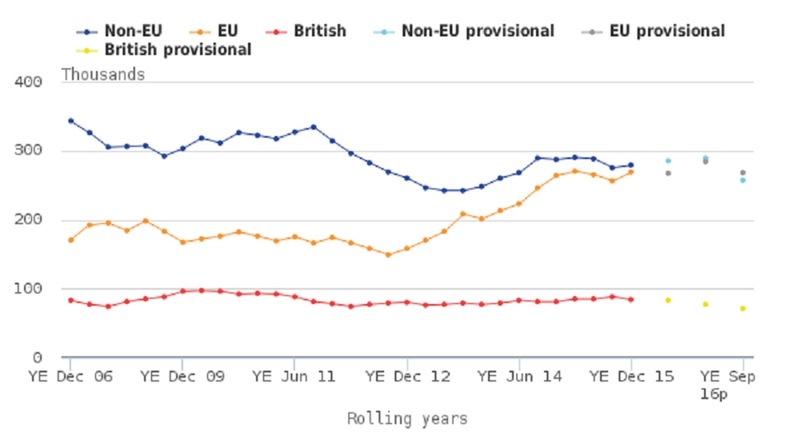 And they show – as I predicted back in August – a fall in EU migration to the UK, particularly those coming from the countries of Central and Eastern Europe (the “EU8”) that joined the EU in 2004; in the year to September, net migration from these countries fell by about 20,000. Meanwhile, the number of new National Insurance registrations in the year to December was flat, but again numbers from the EU8 fell. Broadly, the figures are consistent with the fall in the number of EU nationals in the UK workforce that I highlighted last week. 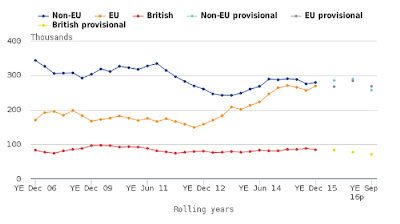 Non-EU immigration also fell, particularly for students, now at the lowest level since 2002. So what’s going on? After all, nothing has changed in law or policy terms– we are still a member of the EU, and will be for some time, and we still have freedom of movement. But it’s not just today’s law that matters to existing and future migrants. I also warned back in August that even if politicians behaved sensibly, dealing with the status of EU nationals already here was likely to be an intractable bureaucratic tangle. Since then, the government has done little or nothing to reassure them, nor to streamline the process. It is hardly surprising that some are already choosing to leave. More broadly, if people cannot plan with any confidence, not just about themselves but their families, they are both less likely to come and less likely to stay. Small wonder that employers – not just farmers, but sectors ranging from the National Health Service to universities – are finding it far harder to persuade EU nationals to take up jobs in this country. And this, once again, illustrates a vitally important point; migration is not just a matter of the UK choosing migrants; migrants have to choose us. Even if we wish to remain open to skilled migrants from elsewhere in the EU post-Brexit, they may not choose to come here (or remain here). It is still very early days – forecasting migration flows, particularly at a time of policy change, is extremely difficult. But we can already begin to sketch out the long-term implications. If, as my previous research predicts, net migration from the EU falls by more than half over the next five years, the economic impact on the UK will be significant; the resulting hit to GDP could be about 0.6 to 1.2%, with a GDP per capita reduction of 0.2 to 0.8%. Over the period to 2030, the resulting reduction in GDP per capita could be up to 3.4%. By contrast, the increase in low-skilled wages resulting from reduced migration is expected to be relatively modest. So those who – from both sides – have argued that Brexit will not lead to a substantial fall in migration, especially from the EU, are wrong. Indeed, the government’s target of reducing migration to the “tens of thousands” is not nearly as unrealistic as many think – particularly if the labour market weakens significantly over the next year or two. But the government – and those who support an end to free movement – should be careful what they wish for. Perhaps it will ease very slightly pressure on the wages of some low-paid workers; but this will be far outweighed to the cost to us all in growth and tax revenues. Launching the Home Affairs Select Committee inquiry on immigration, Yvette Cooper called for a "national debate" claiming that immigration "was was one of those things that people just thought was a bit too difficult to talk about". As Stephen Bush points out, virtually the only plausible explanation for this nonsensical assertion is that Yvette is somehow stuck in a Star Trek style time loop. I first started working on immigration issues in the Cabinet Office in late 1999; migration, in one form or another, hasn't been out of the news since. The paper I wrote then was published in early 2001, accompanied by considerable publicity, precisely because Tony Blair (and some of his Ministers, like Barbara Roche) wanted a constructive debate on immigration. Sadly, they largely failed, as Yvette's intervention today and countless others like it from politicians who should know better show. immigration doesn't appear to have any negative impacts on the employment prospects of native workers (indeed, the employment rate is at historic highs). While the evidence on wage impacts is less conclusive, the emerging consensus is that recent migration has had little or no impact overall, but possibly some, small, negative impact on low-skilled workers. But other factors, positive and negative (technological change, policies on tax credits, the National Minimum Wage) were far more important. the impact of immigration on productivity and hence (per capita) growth is methodologically harder to estimate. But there is growing empirical evidence, based on cross country data, of positive impacts from migration on productivity and per capita GDP. and is likely to reduce GDP, GDP per capita/living standards, and worsen the UK's fiscal position. A useful "public debate" might begin with this evidence base and move on from there. We can but hope. My full written testimony, with references, is here.